QUESTION: What are vows? Does the Bible say we can get out of them? ANSWER: Vows are frequently mentioned in the Bible. Except for a very few instances in the New Testament (e.g. Acts 18:18, 21:23 - 26), the majority of these proposals appear in the Old Testament. Vows are voluntary and conditional (usually) proposals made to God (most of the time). In one of its most basic forms, a person promises God that they will do something if He does a certain action. The first mention of vows in the Bible is a perfect example of this type of "if . . . then" proposed agreement. The patriarch Jacob, as he travels through Canaan, dreams about a ladder rising to heaven. He then hears God confirm the promise made to both his father Issac and grandfather Abraham regarding their inheritance. Fearful that he was not mindful of the holiness of where he rested, he vows to make the Lord his God (Genesis 28:20). Women were also known to make vows, such as Hannah, a woman who was barren. She prayed that if the Eternal healed her and gave her a son that she would dedicate him, from birth, to serve him (see 1Samuel 1). 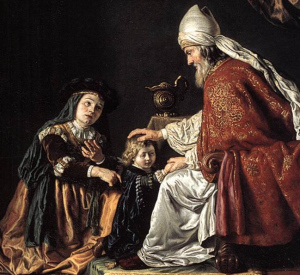 The son she produced became the prophet Samuel, who would become one of Israel's Judges. What promises has God not fulfilled? Is allegiance to a flag idolatry? How serious and binding are making these promises to the Eternal? Does God require they be kept no matter what, even if they break one or more of his commandments or laws? The Bible clearly commands that such promises, rightly made, are to be kept (Deuteronomy 23:23, see also Ecclesiastes 5:4, Proverbs 20:25, etc.). The Eternal does not expect vows be kept if they require the committing of a sin. For example, in the New Testament, we find a rather violent one-way promise made against Paul. A group of zealous Jews publically promised not to eat or drink until they successfully murdered the Apostle (Acts 23:12)! Clearly, our Father did not require such a promise to be carried out! This principle helps explain what happened to Jephthah's daughter, who many believe was slaughtered due to one of her father's vows. The Bible does offer a way out of keeping many kinds of vows! Land (Leviticus 27:16 - 25), a person's home (verses 14 - 15) and even people (verses 2 - 8) involved in such promises could be redeemed (bought out of) the commitment for a certain fee. Men ages twenty to sixty who were to be consecrated to serve the Eternal could be bought out of their commitment for fifty shekels of silver (roughly $400 U.S. for silver at $20 per ounce) or possibly less. Females in the same age group could be redeemed out of a vow for thirty shekels. Vows to God should not be made lightly. He expects those he has called to fulfill their promises with simplicity and integrity (Matthew 5:33 - 37). Christ understands, however, our weaknesses and temptations to sometimes act foolishly (Hebrews 4:15 - 16). Those who wish to get out of such promises should seek the Eternal in prayer to find out what is the redemption price for their situation. Why was silver worth more than gold?